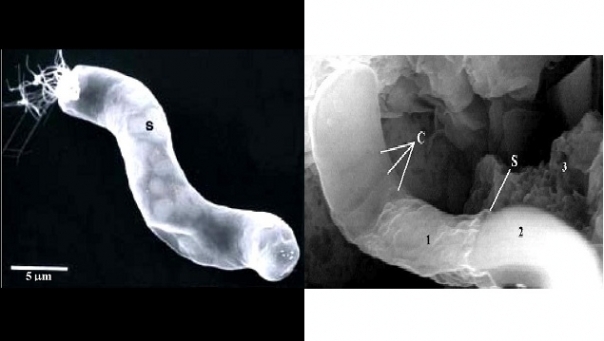 On the left is a microphotograph of a bacterium called Titanospirillum Velox. This image was take by Ricardo Guerrero et. al. in 1999. On the right is a photo from Richard Hoover's paper showing a fossil that appears similar. Or at least that’s what the headlines said last week. Yes, a NASA astrobiologist published a paper claiming he’d found convincing evidence of life as fossils in a meteorite. Hey, wait. Didn’t we go through this already a few years ago? In fact, it’s been 15 years – can you believe it? – since NASA’s David McKay reported that the markings in a meteorite named ALH 84001 looked like they had been made by living bacteria. Since ALH 84001, found in Antarctica’s Allan Hills, was thought to be a chunk that had been blasted off the surface of Mars and sent on a trip to Earth, that was big news. It was even bigger news since ALH 84001 was very old – from a time when Mars was wet enough that it’s plausible that bacteria might have lived there. Except that it probably wasn’t true. ALH 84001 was subjected to a battery of tests over the years following the initial paper, and there was no trace of biologic compounds. And plenty of other scientists came up with alternate theories for how the meteorite’s strange markings might have come about. To this day nobody knows for sure what caused those marks – but there’s no convincing evidence they were caused by life. Fast-forward to March 5 of this year, when the new “life in a meteorite” story broke – in an exclusive on Fox News, of all places. Doesn’t that give you a warm and fuzzy feeling already? Dr. Richard B. Hoover, of NASA’s Marshall Space Flight Center, published a paper in the Journal of Cosmology claiming he’d seen convincing evidence of microfossils similar to cyanobacteria in several carbonaceous chondrite meteorite. The story came with scanning electron microscope photos that looked like giant worms – or at least something you might buy in plushy form from GiantMicrobes.com. And about that journal – why is a study that mixes biology and meteor astronomy showing up in a cosmology journal? The Journal of Cosmology turns out to be a small open-access publication, and doesn’t seem to get a lot of respect in scientific circles. About the Hoover paper it makes some grandiose claims, such as “”No other paper in the history of science has undergone such a thorough vetting”. Apparently the paper was rejected from a few other publications before Hoover settled on the J. of Cosmology. That doesn’t make it wrong – but it does call for a skeptical eye. Those markings in the rock could have come from bacteria after the meteorite landed on Earth – or they could be something else entirely, and have nothing to do with bacteria. Most of the experts seem skeptical about this one, too. Let’s sit back and watch how it all shakes out; but I don’t think we should expect a rain of little blue-green microbes from space any time soon. Meanwhile, there’s not much to look at in the April evening shallow sky. Mars, Venus, Neptune and Pluto are all in the morning sky, joined late in the month by Jupiter, Mercury and Uranus. That leaves Saturn as the only planet visible in the evening. Of course, Saturn’s always lovely, with its rings tilted at a bit over 8 degrees. So be content with Saturn, the moon, and an increasingly active sun – there were some spectactular solar prominences last month, for those who own an H-alpha filter (or borrowed one from the club). And if you want to see cyanobacteria, head to your nearest reservoir instead of your meterorite collection.